Matteo Salvini (L) and Benjamin Netanyahu in Jerusalem, December 2018. 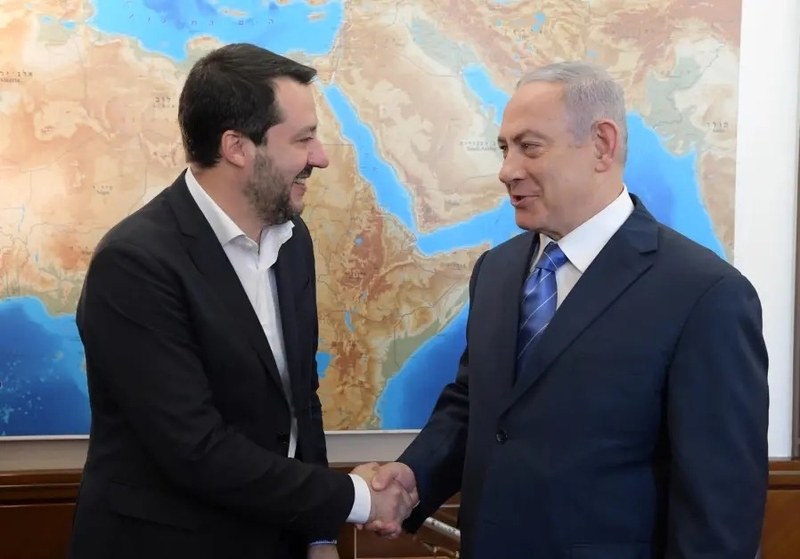 Note the contrast: When Matteo Salvini, Italy's interior minister, recently visited Jerusalem, which he hailed as the capital of Israel, Prime Minister Benjamin Netanyahu called him a "great friend of Israel." Back home, however, Italy's liberal Jews denounced Salvini for, among other things, his Roma policy and his alleged "racism against foreigners and migrants." A similar battle, pitting the mighty State of Israel against small and shrinking Jewish communities, takes place in many European countries, invariably arguing over the same subject: what the press calls far-right, populist, nativist, or nationalist parties – and what I call civilizationist parties (because they primarily aspire to maintain Western civilization). Israelis unsurprisingly focus on these parties' foreign policy, broadly seeing them as its best friends in Europe, while Europe's Jewish establishment no less predictably emphasizes the parties' domestic profile, portraying them as incorrigibly anti-Semitic, even auguring a return to the 20th century's fascistic dictatorships. However parochial and marginal this intra-Jewish battle may seem to the larger world, it actually matters greatly, potentially influencing the future course of Europe. That results from the unique moral authority bestowed by the Holocaust on Jews to judge who is a fascist and who is not. Or, in the more subdued phrasing of The Wall Street Journal, "While Jewish voters may represent a relatively small portion of the electorate in many European countries, winning their support could help improve the public image of far-right parties." If Jerusalem prevails, civilizationists can more easily and quickly join Europe's political mainstream, reach power, and tackle their priority issues of controlling immigration and combatting Islamization. If the local Jewish establishment prevails, civilizationists will struggle longer to gain legitimacy, and thus will reach power more slowly and attain their goals with far more pain. Jews living in Europe (excluding Russia) number about 1.5 million in a population of some 600 million, or 0.25%; that's about the same as the number of Hindus and one-twentieth the number of Muslims. Unlike those new religious communities, Jews have endured a troubled two-millennium history in Europe marked by blood libel and other conspiracy theories, the Crusades, ghettoes, and pogroms, culminating the Holocaust. Also unlike those growing immigrant communities, the simultaneous challenges of mass Muslim immigration, rampant anti-Semitism, and leftist anti-Zionismrender European Jewry's condition so precarious that in France, where Jews make up less than 1% of the population they experienced nearly 40% of racially or religiously motivated violent acts in 2017. A recent poll finds 38% of Europe's Jews contemplating emigration from the continent. This historically fearful community at present still keeps its head down. With the partial exception of France, Europe's Jews tend to adopt quasi-anti-Zionist views to appease Israel's critics. This explains such outrages as the Anne Frank House in Amsterdam comparing former Israeli Prime Minister Ariel Sharon to Hitler, while a Jewish Museum in Berlin exhibit on Jerusalem almost exclusively emphasizes that city's Muslim history and character. Jewish leaders also stay largely mute about mass immigration and direct their collective hostility to civilizationist parties, an act of Jewish civic virtue required by the European establishment if Jewish leaders are to stay respectable, keep their access to the government, and be treated gently by the mainstream media. In France, for example, Gilbert Collard of the National Rally may be "an unconditional defender" of Israel, but praise what he says means finding yourself promptly called a racist and excluded from polite society. To be sure, some civilizationists retain racial, conspiratorial, and bigoted views of Jews; vigilance is needed to ensure that their professed friendship is not just a tactic to win approbation and legitimacy. But civilizationists are not the Jews' major problem. On the political level, they do not promote unfettered immigration and a multiculturalism that tolerates or even encourages Islamization, the twin existential threats to Jewish life in Europe. On the personal level, civilizationists do not pose the main danger to Jews; a massive survey of discrimination and hate crimes against Jews, the European Union Agency for Fundamental Rights found that "the most serious incidents of anti-Semitic harassment" are perpetrated 30% by "extremist Muslims," 21% by left-wingers, and 13% by right-wingers. In other words, Islamists and leftists together harass Jews four times more than civilizationists. Despite this, many European Jews – and their leaders especially – engage in a humiliating courtship of the Establishment – political parties, media, educational institutions – paying homage to the moral superiority of precisely those forces ruining their lives. To use Bat Ye'or's terminology, they have adopted the behavior of dhimmis (the historic second-class status of non-Muslim monotheists living under Muslim rule). For a prime example of this, note Rabbi Pinchas Goldschmidt, president of the Conference of European Rabbis. He ever-so-mildly warns that a Prime Minister Jeremy Corbyn would cause Jews to leave the U.K. while emotionally vilifying civilizationists for posing a threat to return to "total dictatorships" and denouncing their pro-Israel policies as illegitimately pursuing a "kosher stamp" of approval. The Netanyahu government appreciates that anti-Establishment parties bucking the verbally warm but substantially cool pattern of Europe's legacy parties: Whereas the 3Ms (Theresa May of the United Kingdom, Emmanuel Macron of France, and Angela Merkel of Germany) speak positively of Israel, they more significantly participate in Israel's delegitimization at the United Nations and support the Iran deal that most Israelis see as a mortal threat. More generally, Israel Hayom journalist Eldad Beckpoints to "the duality of the German position that sees Berlin declare its commitment to Israel's existence and security while at the same time throw its support behind bodies that undermine the existence and security of the Jewish state." Unlike such platitudinous policies, civilizationist parties (again, with a French exception) view Israel as a moral partner in arms and an ally against Islamism. They show this by fighting anti-Semitism, building Holocaust museums, denouncing the Iran deal, urging the move of their embassies to Jerusalem, learning from Israel's security services, and protecting Israel's interests within the European Union. Geert Wilders of the Netherlands lived in Israel for a year and subsequently visited it dozens of times. That Europe's Jews live more safely where civilizationists impose strict controls on migration only reinforces Israeli appreciation; as Evelyn Gordon notes, in 2017, "Hungary's 100,000 Jews didn't report a single physical attack, while Britain's 250,000 Jews reported 145." Responding to this warmth and security, Israel's government increasingly cooperates with civilizationists – but then faces the wrath of Europe's Jews whom it has vowed to protect, leading to something of an impasse. For example, Jerusalem clearly wishes to work with Austria's pro-Israel Foreign Minister Karin Kneissl, the appointee of that country's civilizationist party, but Austria's Jews have strenuously denounced this prospect, going so far as to warn that "they'll fight" Jerusalem. Two preliminary points: Of course, neither European Jews nor Israel's government are monolithic. Paula Bieler in Sweden, Gidi Markuszower in the Netherlands, and Davis Lasar in Austria represent their civilizationist parties in parliament; Juden in der AfD supports Germany's civilizationists. In contrast, Israel's President Reuven Rivlin acts like a dhimmi: writing about anti-Semitism in a London newspaper, he politely avoided even mentioning Corbyn's name while elsewhere viciously characterizing civilizationistsas "neo-fascist movements ... that have considerable and very dangerous influence" (this despite his acknowledging "their strong support for the State of Israel"). Consistent with this attitude, Rivlin refused to meet Salvini. Second, this European tension has an American parallel: Israel's government has far better relations with the Trump administration than does the U.S. Jewish establishment. Symbolic of this, when Donald Trump went to Pittsburgh to mourn the massacre of 11 Jews at a synagogue, the local Jewish community protested his presence, leaving Israel's ambassador to the United States alone to welcome the president. If the battle is heating up, the outcome is virtually fore-ordained: raison d'état eventually will propel Israeli governments to override local Jewish concerns and work with civilizationists while Europe's Jews will continue to emigrate, causing their voice to grow ever-weaker. This will be a good thing, for civilizationists are not the 1930s-style threat portrayed by opposition politicians and the mainstream media, but a healthy response to an extraordinary problem. Indeed, the more rapidly the Israeli voice predominates, the better for everyone – Europe, its Jewish population, and the State of Israel. The only question is, how soon will this happen.